Spider-Man’s Homecoming suit, seen here, seems like it’s getting an upgrade. Phase 4 of the Marvel Cinematic Universe begins in July with the release of the Spider-Man sequel, Spider-Man: Far From Home. It’s currently filming in New York, which means lots of rogue camera phones hanging around, and one caught something very, very cool. Instagram user ComicGodz posted a quick glimpse of Spider-Man (which may or may not be Tom Holland in this case) taking M.J. (Zendaya) off the streets of New York...in a brand new red and black suit. From some other angles, the suit is actually quite similar to the Homecoming suit, save for the black coloring and amazing white Spider on the back. 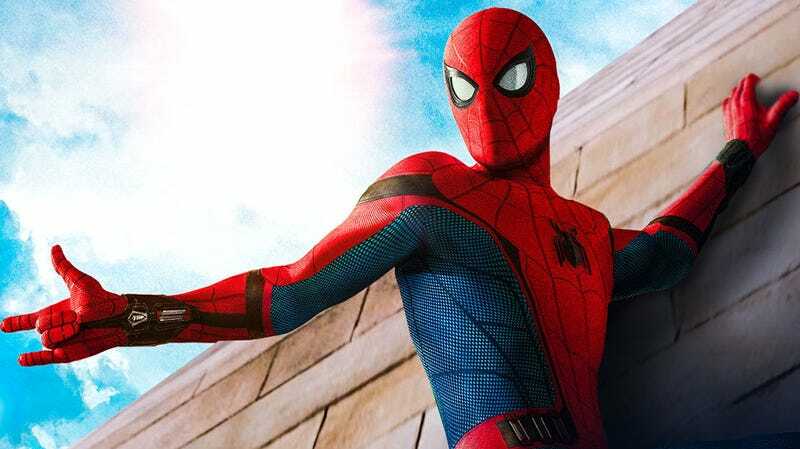 It invokes the earliest versions of Spider-Man’s designs in the comics, as illustrated by the legendary Steve Ditko—initially, Spider-Man was drawn with a primarily darker suit that had blue highlights (which eventually became the suit’s iconic color), so it’s nice to see the film call back to that. As for what’s happening in the movie at this point, really, we have no idea. Far From Home had been shooting for several months in and around Europe and we were the first to report the film would be largely set in Europe as Peter and his friends go on some kind of trip. But, obviously, they’re all from New York so part of the movie will be there. That means this is probably either near the beginning or the ending. Plus, considering when last we saw Peter he was getting dusted by Thanos, one has to wonder if this suit is another Tony Stark creation, or if it’s just what came back with him from, well, wherever he was. Also, if you follow Morning Spoilers at all, you’ve probably read or seen that many other spy photos from Far From Home have hit the web in recent weeks. Images of Jake Gyllenhaal in what looks to be Mysterio’s costume as well as kind of a dark, mysterious, almost Spider-Noir costume for the web-slinger. How this all ties together is anyone’s guess, as is how the hell the story gets to this moment. And still, it all looks awesome. We can’t wait. Spider-Man: Far From Home will be out July 5, 2019.